Free Comic Book Days Culver City! Visited Free Comic Book Day at The Comic Bug Manhattan Beach and still not had enough? Or maybe you had to work Saturday and missed it? That's okay! We've got ya covered! 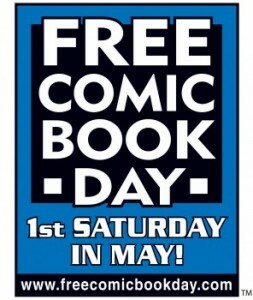 It's FREE COMIC BOOK DAY: THE NEXT DAY IN CULVER! Our Sunday event in Culver City was such a success that we decided to bring it back for another round! We'll have some familiar creators from the day before as well as a whole bunch of ALL-NEW faces that want to join us in keeping the party rocking! Here's who you can expect to meet at The Comic Bug CULVER CITY on SUNDAY, May 6th from 11:00 a.m. to 4:00 p.m.! All that and COSPLAYERS, FREE COMICS, BIG SALE ITEMS and MORE!!!! See you at The Comic Bug CULVER CITY on SUNDAY, May 6th!! !